The Queen's Royal Regiment (West Surrey) 1/6th Bn. Son of Frank and Phoebe Olive Ethel Clark, of Epsom, Surrey. John Edward Clark was born in 1922 and was registered at Epsom (mother's maiden name - Luxford). His parents, Frank Clark and Olive E Luxford were married in 1920, again registered at Epsom. F Clark is recorded as living at 75 Chapel Way, Great Tattenhams, Epsom between 1945 and 1966. 2nd enquiry to Barbara Rough 12 Jan 07. 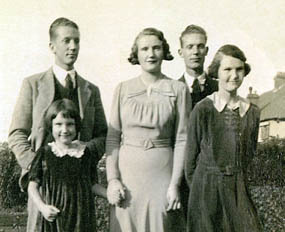 James, or Jimmy as he was often called, was the third of five siblings, Douglas 1918, Joan 1920, Evelyn (Bubbles) 1922 and the youngest Gwen, born in 1930. Gwen, being nine years younger than James, was especially fond of her big brother and the two were very close. She loved to watch him play cricket at the Banstead Cricket Club. James attended Oxted County School where he was a member of Tenchleys House; his exam results over the years from 1934 to 1939 show that he did not particularly excel at school. The family lived at 1 Wilmot Way Banstead. Joan, James' last surviving sister, aged 92 (Feb 2012) remembered their childhood " We moved to Banstead in 1934 on Doctor's advice to get away from clay soil for my mother's heath. [Banstead lies on the chalky North Downs]. I was 14 and Jim 12. We both travelled to school by train, Jim to Oxted County School where he participated in various sports and other school activities. "Jim was an obedient son, very steady in his ways, very close to his mother, thoughtful for others especially his baby sister Gwen who died last year at the age of eighty. He was a son to be proud of but shy and retiring. After he left school in Dec 1939, he worked for a time with tea merchants at Woodmansterne, not far from Banstead. Eventually he volunteered for RAF duty and embarked to North Africa. Before he left he held up a penny and said - Don't tell mum but my life is not worth that." 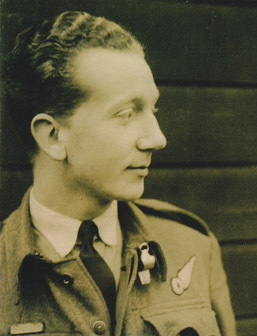 The photograph (above) shows James wearing a standard RAF battledress with his Air Observer's Brevet, the winged 'O', above the left breast pocket. Notice the aircrew whistle on his collar designed to attract the attention of fellow crew members if the aircraft had to ditch. The patch above his right breast pocket is unusual and its identification defeated at least two experts however Allen Clifford, a WWII Air Observer knew it well, and tells us that "It was a surname tag. A little bit of leather was issued to us which we cobbled onto our battledress with black thread, and then inscribed our surname in Indian ink. Nowadays all aircrew have a black patch which bears the brevet and the wearer's name in embroided yellow thread, but then our brevets were just stitched onto our battledress". James was posted to No. 142 Squadron which at the time had already arrived in North Africa, initially based at Blida in Algeria, under MAC (Mediterranean Air Command). The filthy conditions of life in the desert must have been a severe culture shock, but Jim never complained in his letters, remembered Joan some sixty years later. The first record of James flying as part of an established crew comes from the Squadron Operational Records Book (ORB) in an entry dated 12 March 1943. This shows Sgt H W Harbottle as pilot, flying Wellington DF552, with Samuels, Cox, Croxall and Brodie - their target was the Tunis Docks. from 420 Sqn about to be loaded with a Cookie. By April 1943 several of the squadron's Wellingtons were carrying the 4000lb Cookie which was carried by various crews with no apparent pattern, except that a few crews started to carry it on a regular basis. The Cookie was a blast bomb, essentially consisting of a thin walled steel drum filled with Amatol high explosive. When dropped it literally tumbled to earth and detonated upon contact, blasting open roofs and tearing walls apart. The Cookie was most effective when used against targets with high concentrations of buildings eg cities. It was usually followed by incendiary bombs, the latter raining down into the exposed roofs to start fires after the main blast had done its damage. It seems likely that HZ474 QT-R was the "R" recorded in the ORB as dropping Cookies in April, and this aircraft was often flown by Sgt Harbottle and his crew. 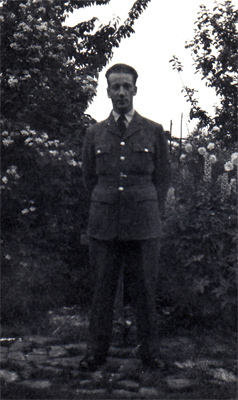 On their tenth bombing run together, on the 23 April, Sgt Harbottle was wounded twice but managed to get the aircraft home making an "excellent" landing. He was immediately taken to hospital. The major air effort in the Middle East in 1943 was in support of allied operations in Tunisia involving no fewer than 10 Wellington Squadrons, with ports and airfields constituting the priority targets. In May 1943, 142 and 150 Squadrons were brought together as '330 Wing , 205 Group' British North African Air Force, under Grp Capt J A 'Speedy' Powell. The two Squadrons were known as Cuty and Jane - a play on their fuselage squadron markings JN for 150 and QT for 142. Although still based at Blida, Powell, pressed for a move to a forward base at Fontaine Chaude, Algeria, and this was achieved on 6 May, thereby enabling the Wing to attack Palermo, Naples, Cagliari, Marsala and Trapani. On 25 May, the Squadron moved again, this time to RAF Kairouan in Tunisia and this proved to be the start of a heavy schedule of bombing missions against Sicily and Mainland Italy. As Sgt Harbotte was hospitalized, James Croxall and the others in the crew were in need of a pilot, and a Sgt W Smith, a pilot, needed a new crew as two of his own crew were injured after baling out. This new team flew seven sorties together between the 8 June and the 2 July 1943; five of the trips were in Wellington HZ474-R. There may well have been more in May however the relevant records for that month are missing. During the month of June, a total of 373 sorties were flown and 1.5 million lbs of bombs dropped - an example of the increasing effectiveness of the Wing. In preparation for Operation Husky — the Allied invasion of Sicily on 9/10 July — an intensive bombing campaign was commenced. James and the crew were on ops every second night over a ten day period starting on the night of 24/25 June. Their sixth outing on the night of the 4/5 July, was to become their final fatal mission. That night the crew took off from RAF Kairouan, Tunisia at 20.47hrs for a raid on Catania, Italy. On this occasion the pilot was Squadron Leader A P Craigie, with whom they had flown once before. At 21.43hrs a signal was received from their aircraft stating that it was abandoning the mission, due to problems with one of its engines. 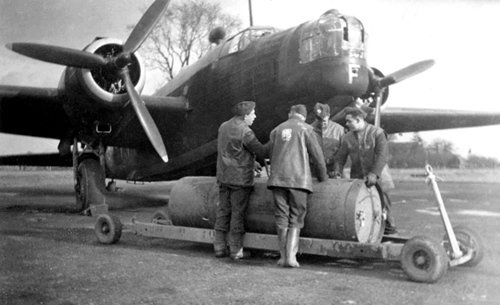 The ORB shows that their Wellington was DF629, one of two other 'cookie' bombers on the squadron, and this may well have been one previously flown by Craigie, but following much detailed research (see below) their aircraft was confirmed to be none other that HZ474-R ie the one they had used many times previously. DF629 continued operations with the squadron and survived until the end of the war, whilst HZ474-R is never mentioned again, thus confirming beyond doubt that the details recorded in the ORB are incorrect. The ORB narrative continues — "A message had been received one hour after take off that he was returning to base owing to engine trouble. Sea searches were carried out throughout today [5th] and traces of a missing aircraft and members of crew were seen at 11.00 hours this morning. No rescues were attempted however, nor was confirmation obtained that this was in fact S/Ldr Craigie's aircraft." HZ474-R crashed into the sea approximately 4 miles off the coast of Augusta, Sicily but this too does not quite tie in with the ORB. Looking at the times the other aircraft left and returned from the Catania sortie, it was a 4.5 to 5 hour round trip. If James' crew was returning to base an hour after take off, how did the aircraft come to crash near Augusta, Sicily? This is very near Catania. The most logical explanation is that the problem with the engine was somehow resolved and having got the engine running properly again, they then resumed the flight to Catania. It's most likely that the 4000lb Cookie was either dropped over the target, or jettisoned before the Wellington hit the water. Given a choice and enough time, the pilot would always jettison the bomb load before ditching. As they crashed in the target area, they were probably brought down by enemy action. on the same Memorial panel. P/O Ian Israel Samuels, later confirmed that the aircraft sank immediately it hit the water, and that he only survived because he was able to swim to the surface through a hole in the aircraft. He could see in the moonlight that none of the others had surfaced and despite an injury to his leg, he decided to swim for land. After several hours, he reach the Sicilian coast where he was picked up by Italian sentries. Ironically, Sicily was not the best place to be at this time because of the intensive bombing being carried out by the RAF. Another fact that must have weighed heavily on Ian's mind is that he was of Jewish Origin. After some time he was transported to Stalag Luft III, in Sagan Germany. Initially he was reported as missing, but news of his capture eventually reached his parents nearly four weeks after the after the incident. 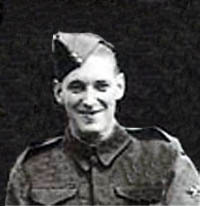 He spent the remainder of the war as a POW and in 1946 returned to his home town of Liverpool where he joined the family business. He died in 2001 aged eighty, having refused to talk to his family about the experience which had affected him so badly. Reference: Panel 8, Column 1. Sergeant James Croxall and the other casualties have no known grave and are amongst the 2,298 airmen commemorated on the Floriana Memorial in Malta. 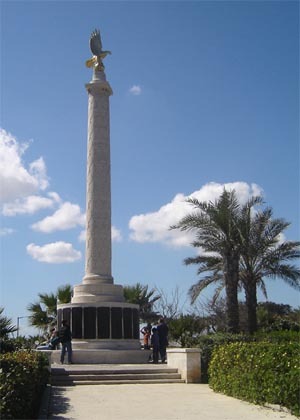 The Malta Memorial commemorates airmen who lost their lives during the Second World War whilst serving with the Commonwealth Air Forces flying from bases in Austria, Italy, Sicily, islands of the Adriatic and Mediterranean, Malta, Tunisia, Algeria, Morocco, West Africa, Yugoslavia and Gibraltar. For further details on the aircraft and the whole crew please click here. Croxall family research by Barbara Rough. Croxall childhood details from letter written by Joan Underwood, James' 92-year old sister (Feb 2012). Cox family research by Greg and Claire Halliday who have conducted extensive research to establish the true facts leading to the loss of the aircraft finally proving that the ORB shows the incorrect aircraft. Claire is Herbert Cox's niece. Samuels details by Viv Alexander Ian Samuels' daughter. HZ474 sorties and history by Mark Evans of the Midland Aircraft Recovery Group who is interested in all 142 Squadron Wellington losses: his findings to date are published online here. 142 Squadron and background RAF information by Mark Stanley. Malta Memorial photo supplied by the Shranz family. Name tag identification by Allen Clifford. Allen was shot down in a Lancaster on 8 November 1944, during a daylight raid on Homberg. His story, written by Philip Turner has been recorded in a book called One of Butch's Boys published by Woodfield Publishing. Image of Wellington Bomber from the collection of Bert Parker with permission from D Parker. More photographs from Bert's collection can be found at RCAF 420 Sqn Tribute. Last updated 18 Feb 2012 Added new page to include more details on the rest of the crew. This error was corrected in 2011. Royal Armoured Corps 23rd Hussars. 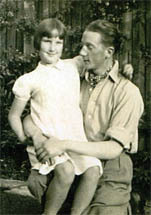 Stanley, the son of Maurice Frederick and Grace Cull, of Epsom, Surrey, was born in Poole and his birth was registered in the first quarter of 1922. His parents' marriage was registered in the first quarter of 1918 in Brentford Middlesex and his mother's maiden name was Fish. Stanley was ginger-haired and liked fighting recalls Noel Phillips who went to school with him. Noel liked him because he stood up for the boys who were the subject of bullying. Stanley had one brother, Ronald, and two sisters Pat and Dorothy. Every member of the Cull family other than mother Grace, was involved in the war effort. 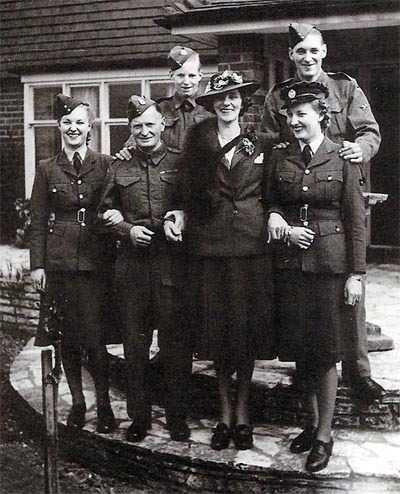 In an article published in a book called Memories of Wartime Banstead District, Pat Cull says "My father, Freddie Cull, was in charge of the Home Guard Unit and my younger brother Ronald, was a Private until he was called up to serve in the Navy. My elder brother Stanley was in the Army (Tank Corps). My sister Dorothy was in the WAAFs doing hush hush work for radar. As for myself, Pat, I was in the Women's Land Amy and later in the WAAFs." The photograph shows Ronald (left) and Stanley (right) at the back. In front are Pat, father Freddie, mother Grace, and Dorothy. Stanley served with the 23rd Hussars which was part of the 29th Armoured Brigade of the 11th Armoured Div. The 11th Armoured Division landed in France in June 1944, taking heavy casualties as part of the Battle of Normandy. By late July, following Operation Goodwood, losses of armour were so high that the regiment had absorbed the remnants of the 24th Lancers, a regiment of 8th Armoured Brigade. 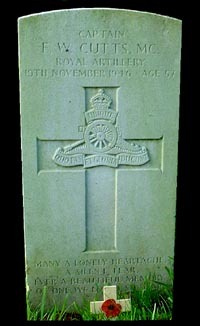 Trooper Stanley Cull died on the 6th August 1944. Based on this date, it is likely that Stanley was killed in action around the time of Operation Bluecoat. General G.P.B. Roberts had reformed his division into two Assault Brigade Groups. The second group, the 29th Assault Brigade Group was made up of the 23rd Hussars (Stanley Cull's unit), the 3rd Battalion, Royal Tank Regiment (RTR), the 8th Battalion, Rifle Brigade and the Monmouths. The Division started to attack on July 30th; it progressed quickly towards the south, seized Martin-Saint-des-Besaces then spotted an intact bridge on Souleuvre river, which enabled it to drive through and get behind the Germans. In what became the famous charge of the bull the division liberated Le Bny-Bocage on August 1st, then progressed quickly southward. Although severely weakened at that time, the enemy remained present and dangerous: along with units of the Guards Armoured Division and 15th (Scottish) Division, the 11th Armoured had to push back a counter-attack of 9th SS-Panzer Division from August 5th. Two days later, around Chênedollé, one single Tiger managed to destroy 14 tanks of the 23rd Hussars. 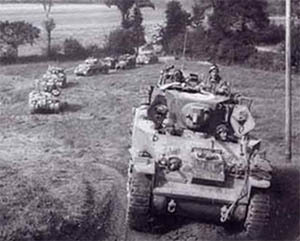 Operation Bluecoat drew substantial forces away from the projected German counter-attack at Avranches, and contributed substantially to the later encirclement of the German forces at the Falaise Pocket. Trooper Cull's inscription on the Banstead War Memorial shows S.Scull instead of S.Cull. The error was noticed early on and was put right, however in a letter dated 24 November 1965, addressed to the Vicar, Reverend F. Schofield, the Clerk of the Council writes that Commander Wemyss-Gorman of the British Legion had received a complaint from Mr F Cull regarding the incorrect spelling of his son's name on the War Memorial. The mistake had been put right once but "repairs are again necessary". Reverend Schofield replied on th 26th November 1965 - "The alteration to the name on the War Memorial shall be attended to." There is no further correspondence on the matter but sadly the memorial still clearly shows the incorrect name. Grave Reference: XXVI. F. 17. BAYEUX WAR CEMETERY Calvados, France. Surrey History Centre ref 6128/1/89 - The letter from Mr Cull is held with other documentation relating to the War Memorial in the files of the Banstead Urban District Council. Tank photograph courtesy of the Imperial War Museum. Family photo from 'Memories of Wartime Banstead District' by E Bond,. 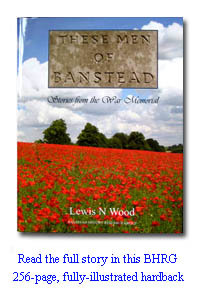 A Banstead History Research Group publication. Updated 20 March 2008 with family photo and Operation Bluecoat details. Royal Artillery 3 A.A. Tractor Bty. Son of John and Sarah Ann Cutts. Husband of Rose Ellen Cutts, of Epsom Downs. Frederick William Cutts was born in the June Quarter of 1889 and his birth is registered in Woolwich. The 1891 census shows him living in Plumstead. At that time his father was 61 years old and is recorded as a Grocer Master. In the 1935/6 phone book, Frederick W Cutts is listed as living at 69 Ferndale Rd Banstead. Three years later, his entry is listed as Captain Frederick W Cutts MC, 136 Great Tattenhams, indicating that his Military Cross was awarded in WWI. It also suggests that he signed up again. 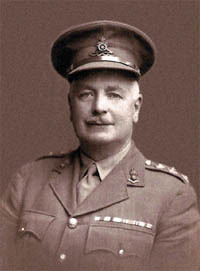 Captain Cutts was well known in Banstead, serving on various local committees and being very active in promoting boys' clubs. He was devoted to his children, twins John and Margot and with his army background was strict on discipline. This made him ideal for one of his roles where he was a Gym instructor at Beechholme residential school. Donald Luff, Margot's husband, clearly remembers how the Captain could not stand his son having a lay in. His death after the end of the war was registered in 1946 at the 'Surrey Mid Eastern Registration District'. Captain Cutts is the oldest man on the Banstead War Memorial and the only one to have served in both World Wars. He died unexpectedly in November 1946 when he suffered a heart attack whilst boarding a bus at Tattenham corner. The manner and date of his death raises a puzzling question - Why is Captain Cutts on the memorial? His family were not aware that his name was on the memorial and are unable to explain why it is present. The Commonwealth War Graves Commission have him included in their casualty list and have also erected his headstone at All Saints churchyard Banstead. We have written to them with this enquiry. Personal details from Donald Luff.